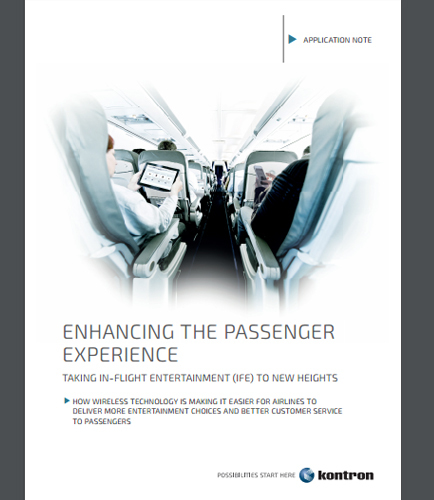 How can a robust wireless system support Aircraft In-Flight Entertainment? "How can a robust wireless system support Aircraft In-Flight Entertainment?" Wireless in-flight entertainment (IFE) system has reached new heights as one of the most dynamic elements of the aircraft interiors industry. With airlines facing an increasingly competitive environment, the in-flight entertainment experience can be a powerful differentiator for passengers when choosing a company to fly with. Frequently cited as a major priority for passengers, the industry continues to push boundaries, developing technologies and products that strive to improve and enhance the airline passenger experience. Who says entertainment cannot be the simplicity of sending an email, booking a taxi or updating your Instagram, all at 30,000 feet? Choosing the right profile maximizes the value of pre-integrated systems, and provides a smart, streamlined design path for OEMs and developers. Pre-integrated systems based on COM Express Computer- on-Modules (COMe COMs) deliver a critical small form factor design advantage for a host of military and aerospace applications. By offering a slate of upgradable, rugged options in a ready-to-use small form factor platform, systems capitalize on carrier board attributes blended with the flexibility of mezzanine options, enabling a powerful competitive advantage in mil/aero system design. This informative whitepaper brings you the solutions to the always-present question of design vs. build and how to quickly and economically meet Proof of Concept (PoC) requirements. It also focuses on: Evaluating Build vs. Buy Dilemma Establishing Profiles Fuel Maximum Design Efficiency Storage Profile, Situational Awareness Profile and Server Profile Adding Flexible Value with XMC and mPCIe Mezzanines Smart Profile Choices Keeping Pace with Mil/Aero Initiatives Download this whitepaper to learn how the pre-integrated systems meet expanding military program application needs. What is Customer Journey ? The complete journey a customer takes while purchasing a product that might include a lot of factors like choosing the right product, taking delivery of the product, interaction with the seller and after sales service. Each of these factors could also be called as touch points. It is of utmost importance for any business to make sure that the customers are happy at every point in their journeys.